Chili is one of those dishes that we consume in our house at least once a month, even in the summer. Nothing beats a pot of homemade chili. In the winter, I like to let it simmer in the crock pot all day on a lazy Sunday. Previously, I kept it pretty simple and made it with just chili beans, kidney beans, diced tomatoes, onions, chili sauce, hamburger meat, and seasoning. Once we decided to go meatless, I started searching for vegetarian chili recipes online. Most of these recipes incorporate more vegetables like peppers, corn, or even celery into the recipe. To me, that’s not chili. That’s soup! So I wanted to stick to my original recipe and just eliminate the hamburger meat. I started with a chopped onion which I sauteed for a few minutes on high heat in a large pot. Then I added a large 40 oz. can of chili beans as my base. Then I added two 15 oz. cans of diced tomatoes. I like Hunt’s diced tomatoes with sweet onions but any kind will do. Then, I added a 15 oz. 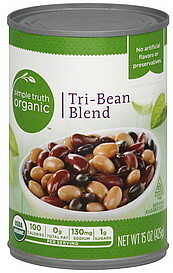 can of Simple Truth Organic Tri-Blend Beans. I was tempted to had two cans but with the chili beans and one can of the Tri-Blend, I thought it had plenty of beans. Next I added 1 packed of chili seasoning. Again, any kind will do. I always add a bit more chili powder for taste anyway. Then I poured in half a bottle of chili sauce. 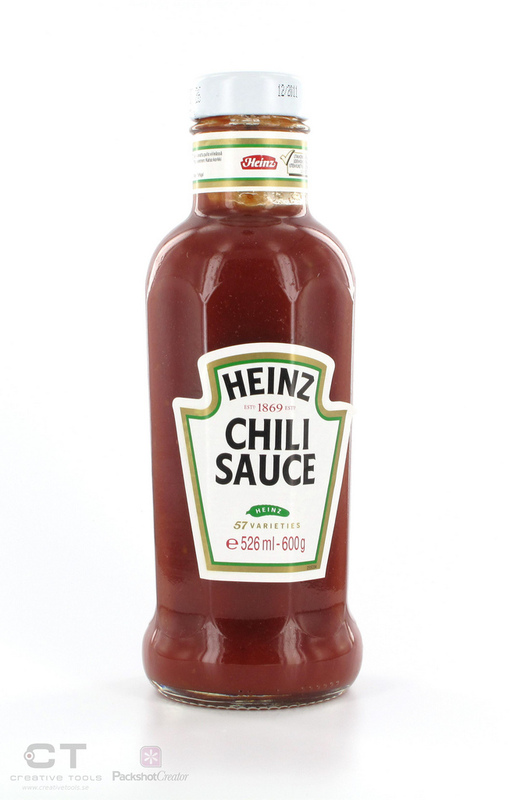 I like Heinz Chili Sauce but will actually buy the generic brand most of the time because it’s cheaper and tastes the same. Add salt and pepper for taste, and most of the time I add about a teaspoon of sugar. We have used a dash of cinnamon before instead of sugar. Yep, you read that right! Cinnamon! I’ve also heard of people adding some dark chocolate to their chili. Give it a try sometime. But for this pot of chili, I used plain old sugar. At this point, I thought the chili tasted great but I had recently bought a new meatless ingredient that I was eager to try. I’d been saving it for tacos, but thought what the heck! 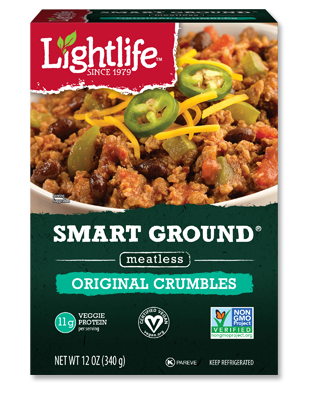 It’s called Lightlife Smart Ground Original Meatless Crumbles. So, we added the entire box to the chili. It’s basically made from beans and only has 70 calories per 1/3 cup. And each serving has 11 grams of protein and less than 1 gram of sugar. And it was awesome! Had I not told you what it was before tasting the chili, you probably would have never guessed that it wasn’t meat. It really helped “beef” up the recipe. We eat our chili topped with a bit of sour cream, shredded cheese, and some corn chips. And it was amazing! We’ve definitely perfected the recipe for meatless chili. Look out, winter, here we come! This recipe made about 6 large bowls (2 cups per bowl). That’s about 308 calories per serving, 23 grams of protein, and 15 grams of fiber. And if you watch what type of beans you use, it will have zero grams of fat! How do you make chili? 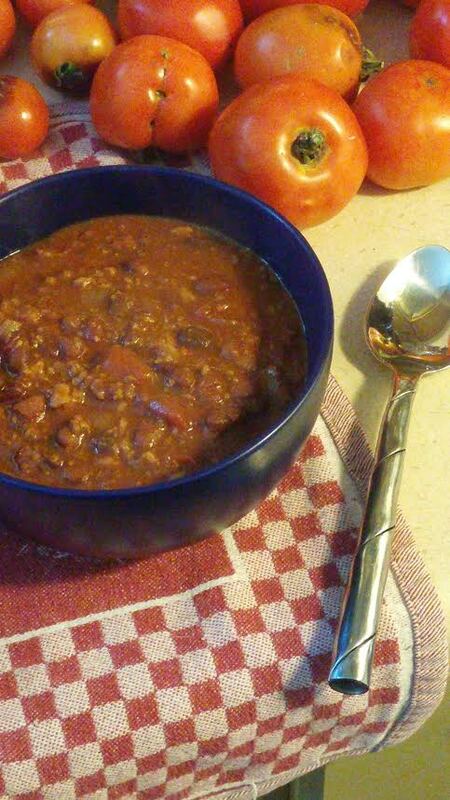 What are some of your favorite staple ingredients for a pot of chili?